For Safety and Protection. 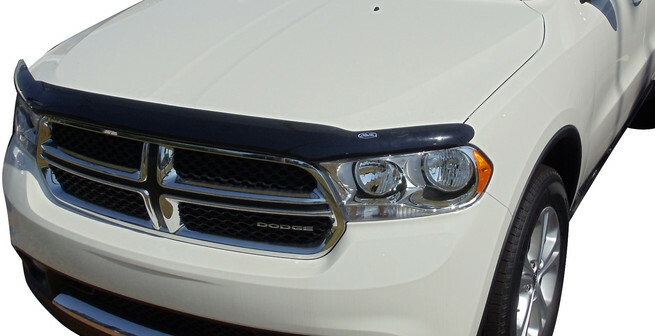 Bug shields or Hood Deflectors are a great looking and very affective way to keep your windshield and hood clean. Protect your truck or SUV hood with the old-school toughness of stout defense. Before we learn about how deflectors perform all these amazing feats, let's take a quick look at the different deflector types. 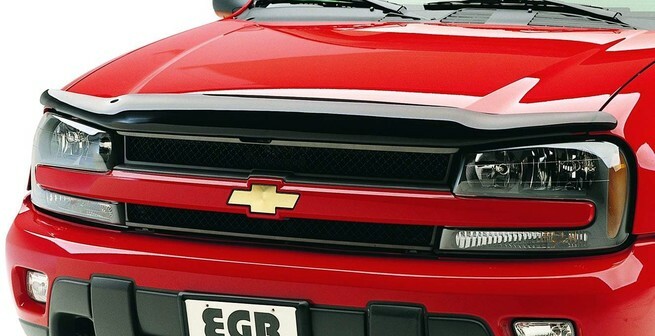 As their name implies, Bug Deflectors are made to keep insects from making a mess on your windshield and hood. They also shield rocks, gravel and other debris from colliding with your hood, fenders and windshield. 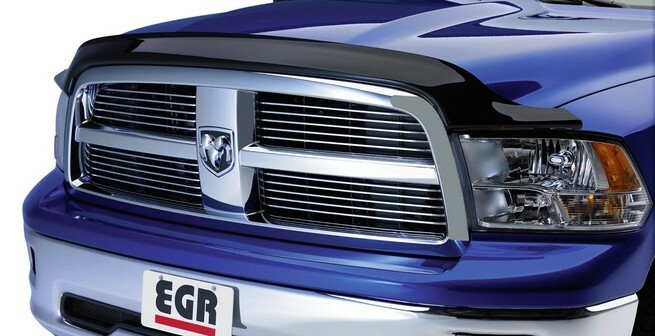 Bug deflectors mount right on the leading edge of your hood, one of the most punishing positions on your vehicle. In order to withstand the harsh conditions, they're built from rugged materials. Most are made from high-impact acrylic plastic. 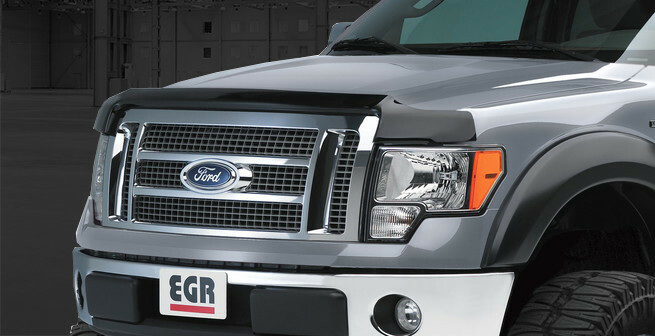 EGR, Auto Vent Shade, and Lund all manufacture bug deflectors from robust plastics. No matter which brand you go with, they all easily mount using either OEM-approved 3M adhesive or hidden screws. Whether you're headed out on a cross-country road trip or driving down the block to the grocery store, chances are you'll run into a bug or two on the way. It seems unavoidable. Their flight plans are always set on a collision course with your front-end. More than just disgusting, their gooey carcasses can impair your driving visibility by mucking up your windshield. A Bug Deflector alters your front-end's aerodynamics to launch wind up and over your windshield—not smack-dab into the middle of it. That way, when bugs zero in on your front window, the new wind current will send them sailing over your cockpit. What's more, a bug deflector will help prevent those plump pests from crash-landing onto your hood. You may think that their slimy corpses are harmless, but their guts can be quite damaging to your paintjob. Most insects have very acidic remains, which will fuse to your vehicle's paint if left unwashed for a day or two. However, you won't have to worry about this type of damage when you install a bug deflector. Aside from their acidic innards eating away at your paint, bugs don't pose much of a physical threat to your vehicle. The same cannot be said for other airborne debris. Kicked-up rocks, gravel and other road rubble can leave nasty gouges, nicks and dents in your finish. Your hood is extremely vulnerable to this type of damage, along with your windshield and fenders. That's where a bug deflector comes to the rescue yet again. Also we offer Paint Protection Films From 3M to protect your paint and resale value. See the Paint Protection Page for more info. Look below to see the types of brands we carry for your ride. Click on the links to see more. One reason why the Interceptor is Lund's most popular bug shield is the quality materials used in production. Heavy-duty polycarbonate is the basis for each Interceptor bug shield, a material often described as "virtually unbreakable." In other words, the love bugs and gnat swarms don't stand a chance. The Wade Platinum Bug Shield by Westin is molded for great looks and platinum defense. Crafted of digitally engineered acrylic, the off-the-hood design of the Platinum Bug Shield follows the lines and curves of your ride.